He is the protagonist of Tokyo Ghoul:re, and is a First Class Ghoul Investigator, the mentor of the Quinx Squad and a member of Team Mado. Haise's duties are overseen by Akira Mado and Kishou Arima. Haise is a self-contained, good-natured individual. As a Ghoul Investigator, he comes off as trustworthy, loyal and devoted. 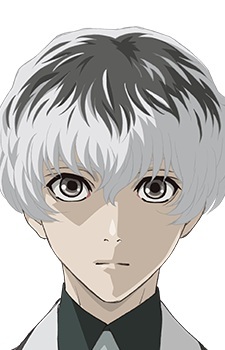 While he portrays a serious demeanour toward his work, Haise is also merciful to some extent, as he believes that an Investigator should not annihilate ghouls unnecessarily. Though he is hailed as the mentor of Quinx, he shows apportioned respect and great concern for his colleagues, pledging a protective streak over them. He also complies with the obligations assigned by his seniors without hesitation. Haise habitually reads books, and is very co-operative, as he'd prefer to work with his group than to single-handedly accomplish the CCG's goals. Haise has a habit of using puns, shown by his conversation with Akira Mado in the Naan restaurant. He also tends to scratch the back of his head when he is thinking hard or feeling uncomfortable. Because of Haise's gentle persona, this leads his subordinates to constantly go out of their way and take the advantage of disobeying him, rendering him incompetent in controlling their actions, and he in turn worries about their safety. Also, unlike Kaneki who accepted his ghoul side, Haise rejects it and seem to be disgusted by his ghoul side as when it tried to convince him to accept it, he ignored it and thought of his mentors to give him courage.